A tutorial on how to make the best cinnamon rolls ever. Made with a tender sweet yeast dough, they are filled with spirals of sweet cinnamon sugar and topped with a rich cream cheese glaze. You’ve been asking for my best cinnamon roll recipe and all the tips and tricks on how to make them perfect and here it is. My most-requested recipe along with all the details to help you make perfect cinnamon rolls every time. The recipe starts with the basic sweet yeast dough recipe that I posted yesterday. 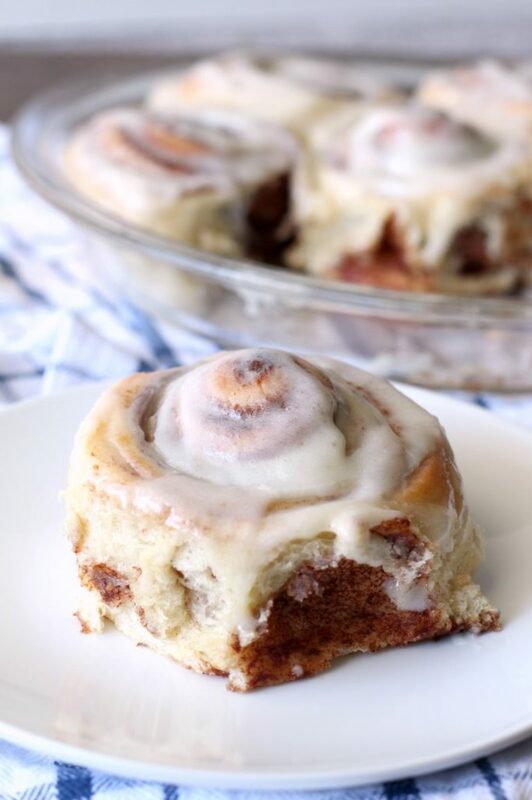 It’s a simple recipe, with only 7 ingredients, but is a rich dough full of eggs and butter that makes a perfect base for these cinnamon rolls. It’s not hard to make, but check out that post for all of the details on how to make a perfect dough. Divide the dough in half. One half of the dough will make about 8-9 cinnamon rolls which can be baked in a pie plate or 8 x 8 inch baking dish. I only roll out half the dough at a time. If you want to make the entire batch of dough, they should fit in a 9 x 13 inch pan. With maybe a few extra to bake in a loaf pan, depending on how thick you cut them. 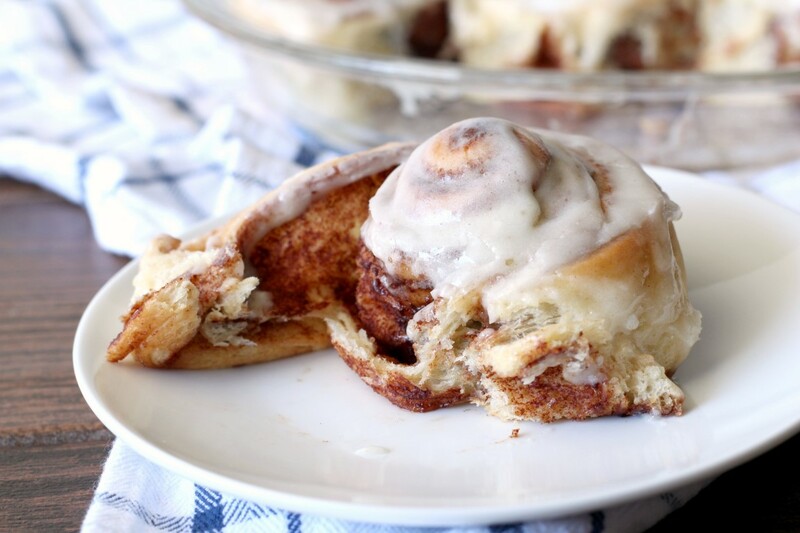 One you have the dough ready, the cinnamon rolls are quick to make. Don’t be intimidated, they are simple to make, especially if you have made the dough ahead of time and have it in the freezer or fridge. (Instructions for that are in the yeast dough post.) Enough background information, let’s make cinnamon rolls! 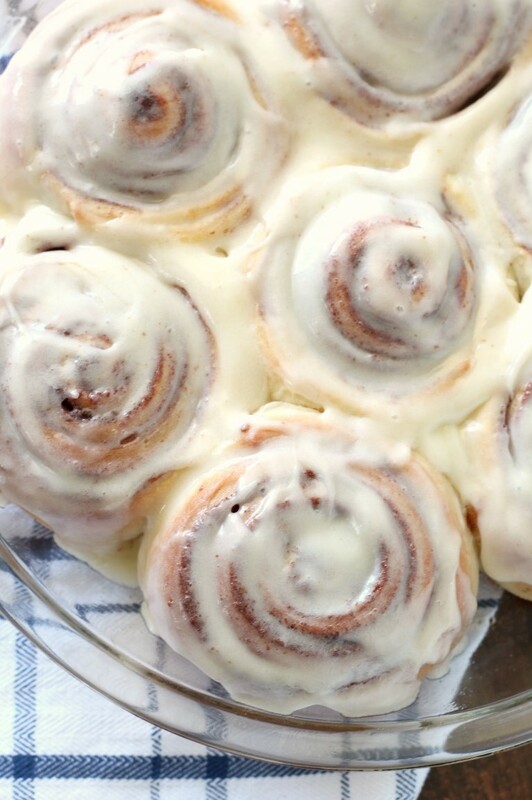 Here’s how to make the best cinnamon rolls ever! Once you have the dough prepped through the first rise, begin by kneading the dough a few times and letting it rest for about 5 minutes. Resting the dough will allow it to relax a bit, making it easier to roll out. 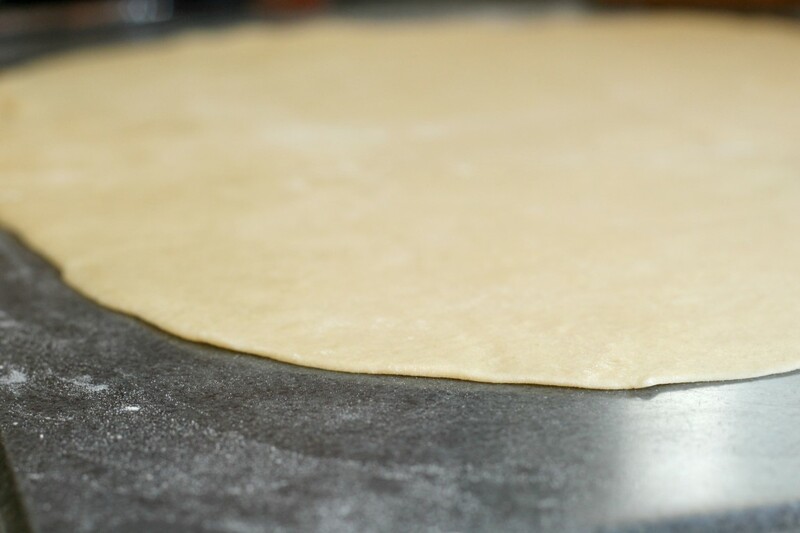 Roll out the dough into a 18 x 12 inch rectangle. As you can see in the picture, the dough should be very thin, no more than 1/4 inch thick. Rolling the dough this thin will give us a perfect, neat spiral for our cinnamon rolls and make sure there is the most cinnamon sugar layer swirled throughout. Be patient in getting the dough to this point and try and keep it as square as possible. 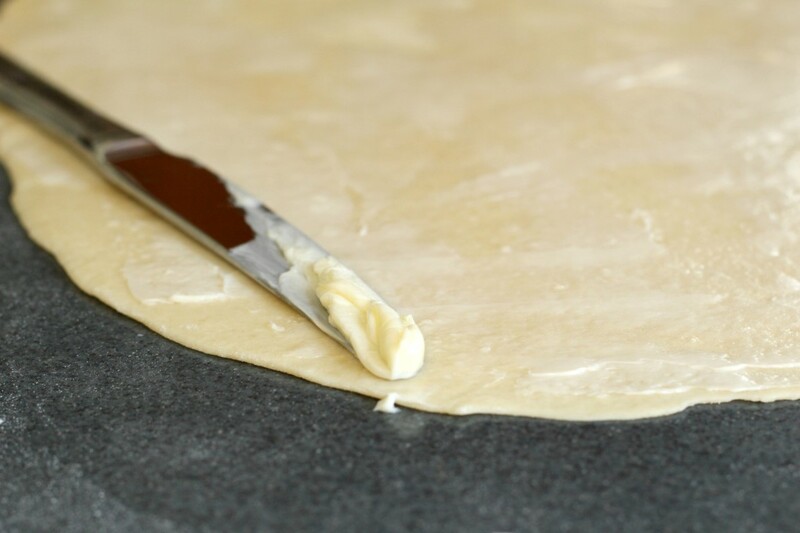 Next, spread a nice layer of softened butter over the sheet of dough. Spread it clear to the edge on all sides except for one of the shorts sides. Leave an inch of space on one of the short sides so you can seal it up after you roll it. Roll them up tightly starting at the short end (the 12 inch side). Starting at the short side will make the giant, perfect spiral. If you want smaller cinnamon rolls, feel free to roll them up from the long side. I do both depending on whether I’m in the mood for giant cinnamon rolls or smaller ones. Seal up the roll by pinching the end tightly. 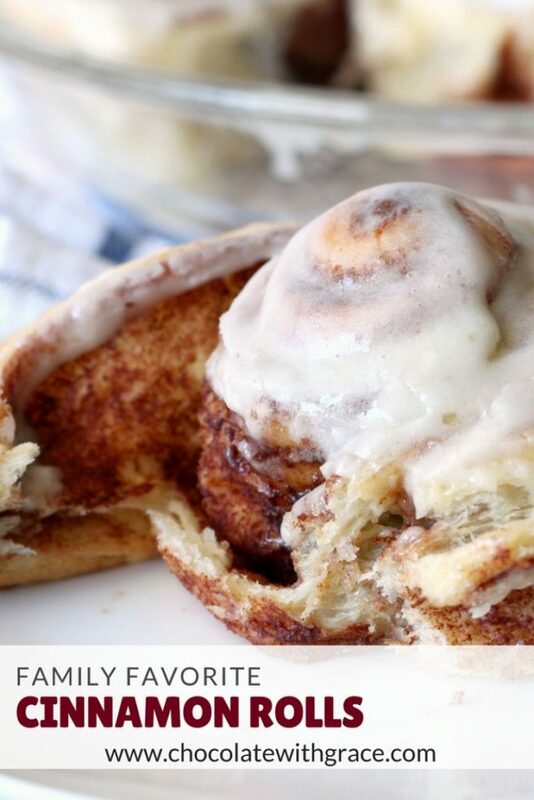 Now here is a trick to cutting the cinnamon rolls that everyone might not know about. 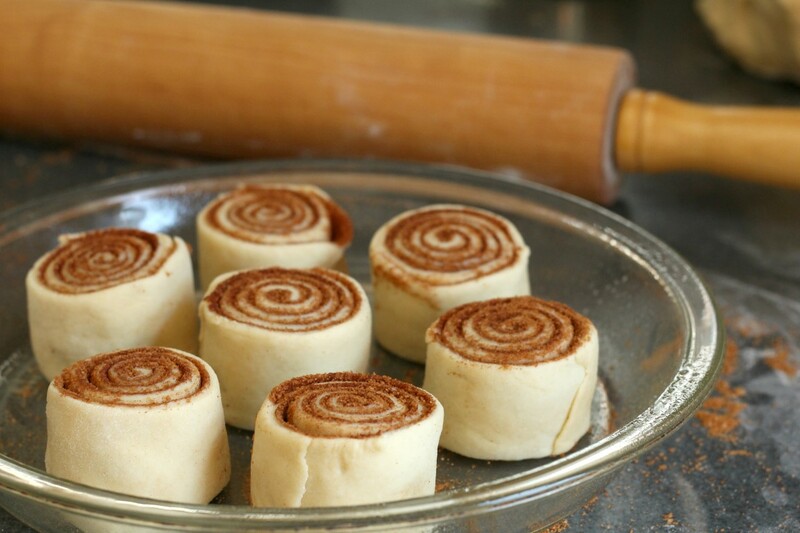 Use a piece of thread or dental floss to cut each cinnamon roll. 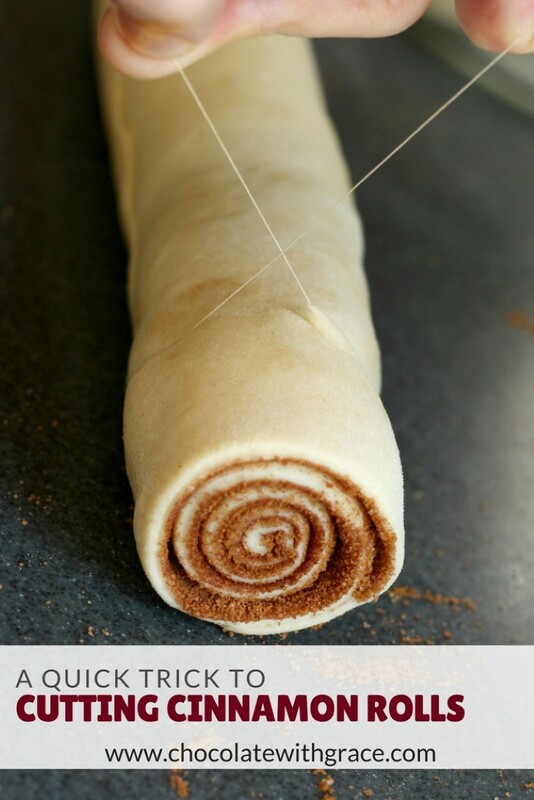 Slide the thread under the cinnamon roll log, cross the ends of the thread and pull the ends tightly in opposite directions to smoothly cut through the roll. No more squishing the rolls with a knife when you’re trying to cut them. 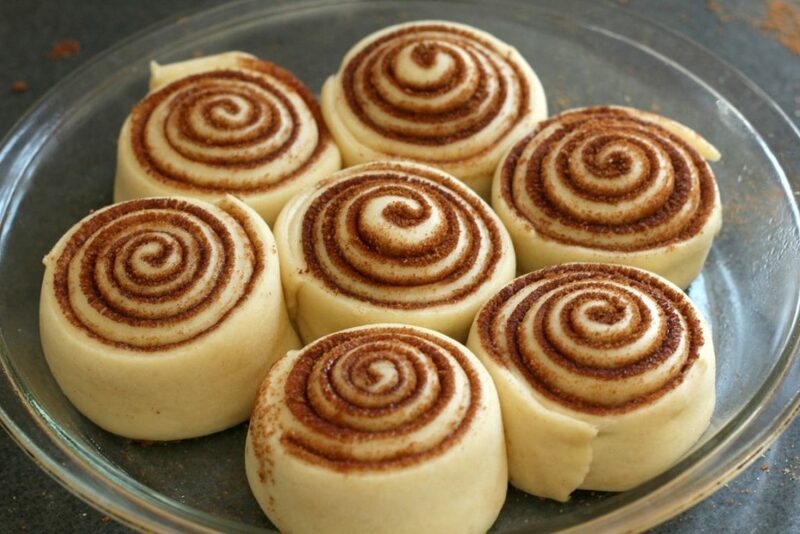 Leaves perfectly cut cinnamon rolls every time. I cut mine about 1 – 1.5 inches thick. Place them in a greased pan. I like glass pans the best as they don’t brown them too quickly, but metal or foil will work too. 7 large rolls will fit in a standard pie plate. That is my favorite for gifting or 12 – 15 will fit in a 9 x 13 inch pan, depending on how big you cut them. Cover them with a clean towel and let them rise until double. The warmth of your house will influence how fast they rise. 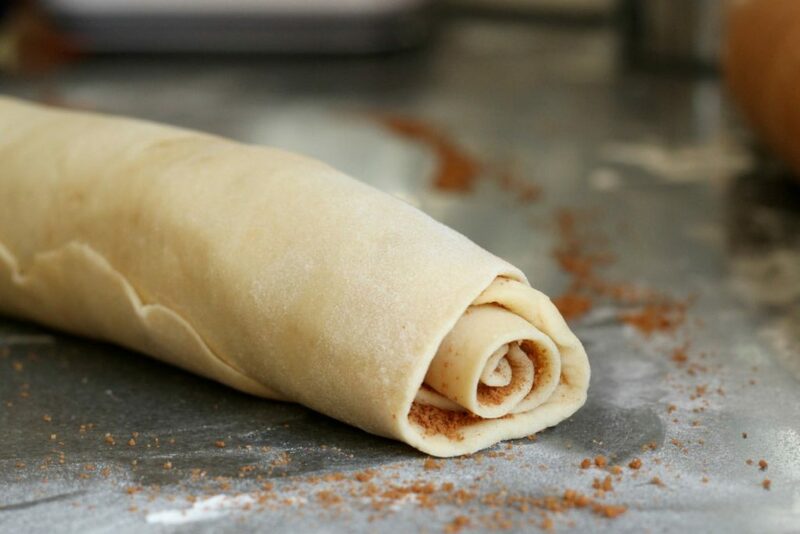 Because we rolled them so thin, they won’t take too long to rise 20-30 minutes. Don’t let them get too big, because if they rise too much, they will deflate and the spirals will separate after they bake. Compare the picture above with the one right below it for an idea of how much they will rise. The photo above shows them before they rise, the photo below shows them right before they go into the oven. They will rise a bit more in the oven, so keep that in mind. After they are risen, put them into the oven, uncovered. They don’t take too long 15 minutes max, so while they are in the oven, make the frosting. You want the frosting to be ready as soon as they come out of the oven. It is simple to make butter, cream cheese and powdered sugar are the main ingredients. They will be just slightly browned when they come of the oven, wait about 5 minutes for them to cool and then spread on the frosting. You want to spread the frosting on while it is warm so it melts halfway and coats the inside of your cinnamon roll for extra gooey goodness. The top will still have a nice thick layer of frosting and the inside will basically be frosted as well! They are best served warm from the oven, but if you offered me one hours later, I would still gladly eat it. 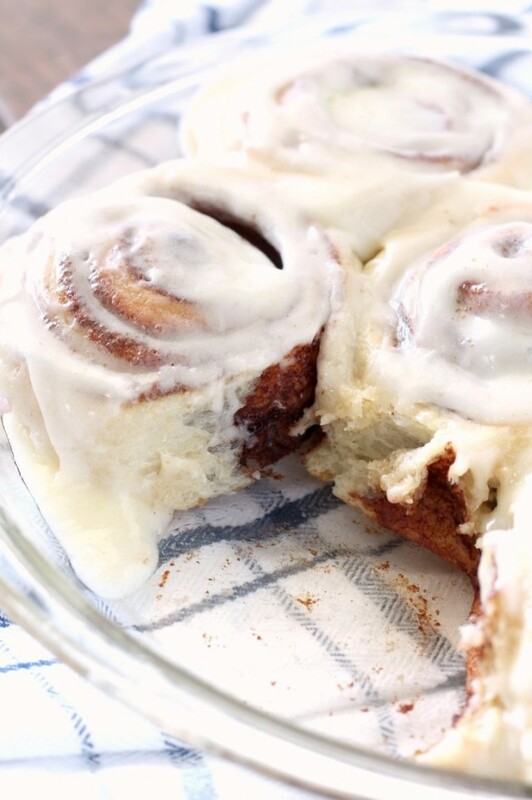 You can use the dough to make them the night before, and then, in the morning, bake them for fresh cinnamon rolls in the morning, without getting up at 6. To do that, make them as normal and place them in the baking pan, but do not allow them to rise, cover tightly and refrigerate overnight. They will rise slowly overnight and be ready to bake by morning. Take them out of the fridge when you start preheating the oven and bake as normal. It may take a minute or two longer since they were cold. 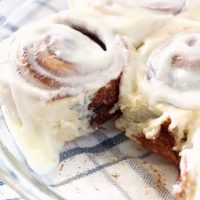 Let me know if you have any questions in the comments and I’ll be sure to answer them and come back tomorrow for another recipe using my basic sweet roll dough. 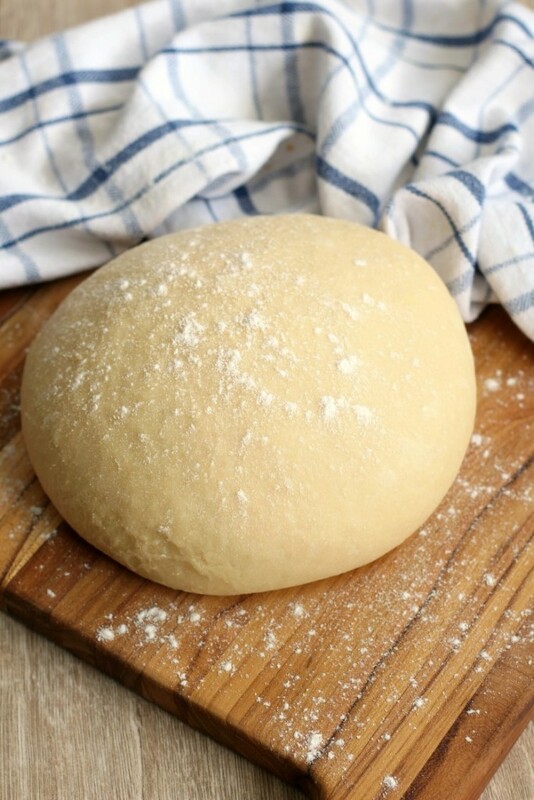 Make the sweet yeast dough as directed in the recipe through the first rise. After the first rise, knead the dough several times and let rest on the counter for 5 minutes. Meanwhile, stir together the brown sugar and cinnamon for the filling. Divide the dough in half and work with one half of the dough at a time. Roll the dough into a 12 x 18 inch rectangle. Be patient with the dough. Spread 1/2 of the butter (1/4 cup) on the rectangle. 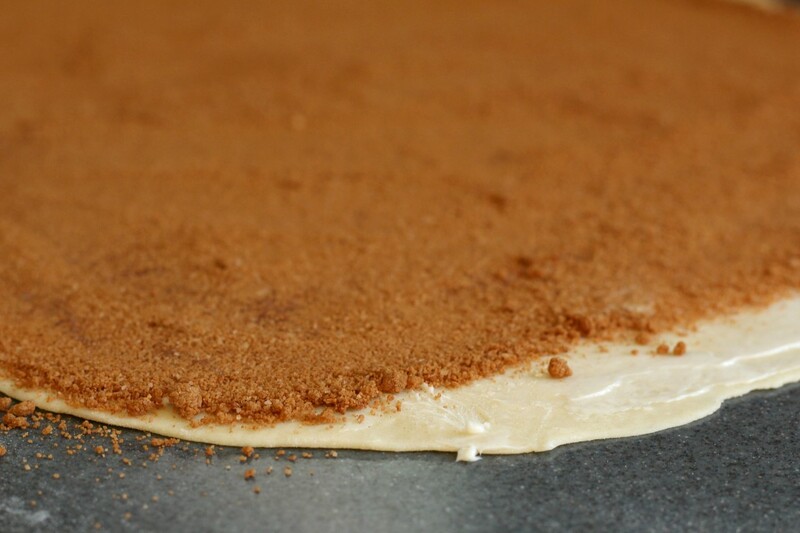 Spread it to the edges, leaving 1 inch section bare on one of the 12 inch sides. Sprinkle 1/2 of the brown sugar filling on top. Roll up tightly starting with the 12 inch side. Cut into 1-1.5 inch sections with dental floss or a very sharp knife. Place 3/4 inch apart in a greased baking dish. Repeat with the remaining half of the dough. Cover and let rise until double, 20-30 minutes. Time will vary based on how warm the room is. Preheat the oven to 375 F. Bake the rolls for 12-15 minutes or until lightly brown on top. While the rolls are baking, make the frosting, beat together the butter, cream cheese and powdered sugar until smooth. Add the vanilla, salt and enough of the milk to make a spreadable consistency. Remove the rolls from the oven and let cool for 5 minutes. Frost the rolls while they are still warm so the frosting will melt a bit. They are best served warm, but will keep a couple days. 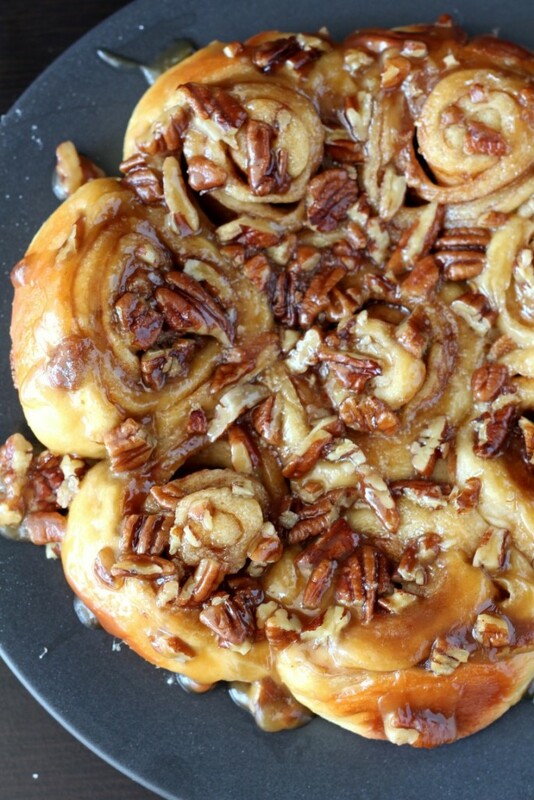 If you’re looking for another sweet to tackle, try my Caramel Pecan Sticky Buns. 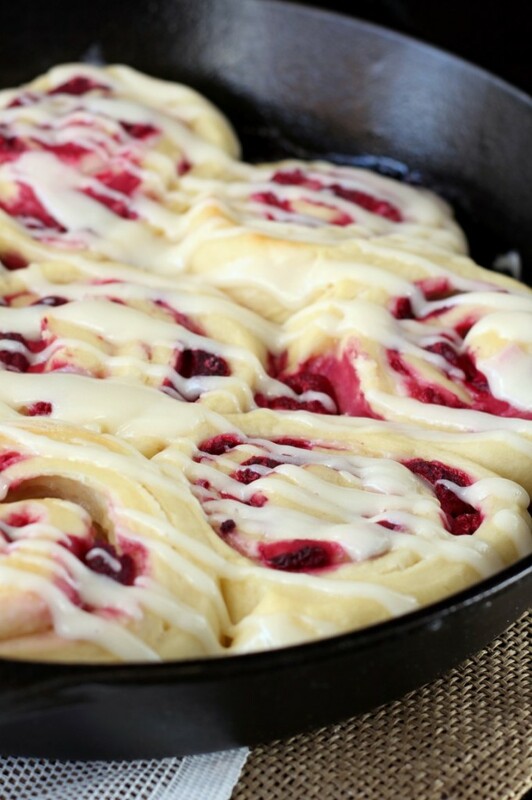 Or how about a raspberry cream cheese sweet roll version! 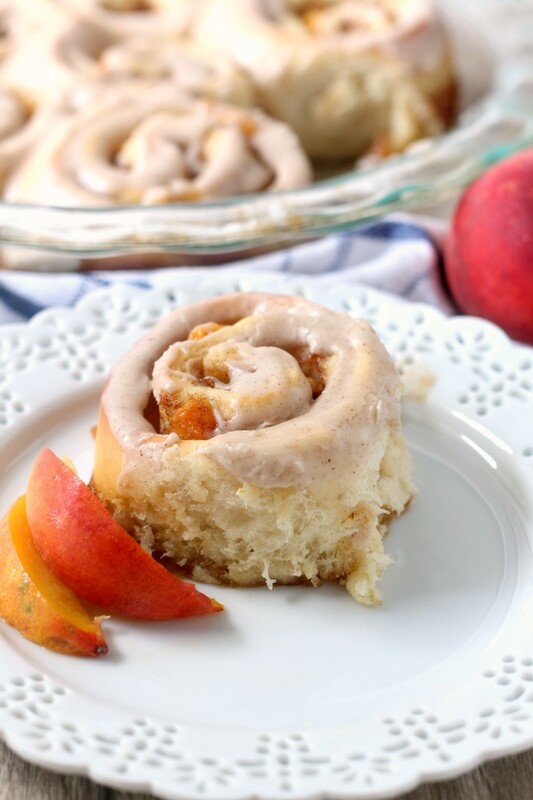 Here are some other flavors of sweet rolls from other bloggers I would love to try! A basic sweet yeast dough that can be used for just about any sweet bread your carb-loving heart desires. Its especially great for sweet rolls, dinner rolls, monkey bread and even homemade donuts. This post has been a long time in coming. One of my favorite things to make are sweet rolls and I already have several recipes on my site. They are fairly easy to make (detailed instructions below!) and everyone loves them and thinks you’re a baking genius who spent hours in the kitchen. You may have that idea about sweet yeast breads as well, but I’m here to teach you how and show you it’s a lot simpler than you think….